I told myself after I was done with Phlebotomy school (May 21, 2008) and with getting my Associate's in Educational Paraprofessional (June 24, 2008) that I was done with school. Period! But, I just can't help myself. At this very moment, I have a fax going to admissions to continue on with my educational journey. I am now going on to attain my Associate of Applied Science in Medical Assisting. I thought this would be a good step since I've just completed my Phlebotomy training and these two fields pretty much go hand in hand. I've also got my EMT certification and I'm a CNA. 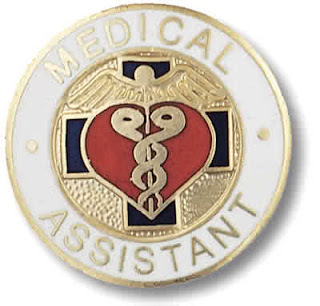 Let me explain a bit about what a Medical Assistant (MA) might do. A MA is a health care professional that performs the administrative and clinical duties that keep the physician's offices or any other health practitioners office running smoothly. MA duties vary from office to office, depending on the location and size of the practice, and the practitioner’s specialty. In small practices, MA's are usually generalists handling both administrative and clinical duties, and reporting directly to an office manager, physician, or other health practitioner. Those in large practices tend to specialize in a particular area, under the supervision of department administrators. As MA's are not licensed professionals they are always required by law to work under the direct supervision of a licensed health care provider such as a physician, registered nurse, nurse practitioner or physician assistant whenever they provide direct (hands-on) patient care procedures. Some states require that MA's who draw blood for lab tests are certified, and have passed a practical examination as part of their phlebotomy training. (Got that part out of the way already!) MA's perform many administrative duties, including answering telephones, greeting patients, updating and filing patients’ medical records, filling out insurance forms, handling correspondence, scheduling appointments, arranging for hospital admission and laboratory services, and handling billing and bookkeeping. Clinical duties vary according to state law and include taking medical histories and recording vital signs, explaining treatment procedures to patients, preparing patients for examination, and assisting the physician during the examination. MA's collect and prepare laboratory specimens or perform basic laboratory tests on the premises, dispose of contaminated supplies, and sterilize medical instruments. They instruct patients about medications and special diets, prepare and administer medications as directed by a physician, authorize drug refills as directed, telephone prescriptions to a pharmacy, draw blood, prepare patients for X-rays, take electrocardiograms, remove sutures, and change dressings. Last but not least they serve as direct link and communicator between patient, physician, and other health care professionals whenever there is a need. We are glad to introduce our selves as one of the leading manufacturers & Exporter of all type Scientific, Laboratory, Surgical, Medical, Hospital, Dairy, Milk Testing Instruments & laboratory Instruments. We assure you about our best and prompt services. Thanking you in the mean time, awaiting for your valued favourable reply, we remain. Thanks for giving us this useful information. I have come some advice to about we have a list of nearby Phlebotomy School that are certified to provide the trainings necessary for you to become a phlebotomist.